Romero’s ‘Day of the Dead’ Is Getting Remade!!! In some unfortunate news, the execs over at Millennium Films, think it would be a good idea to remake a classic zombie film. 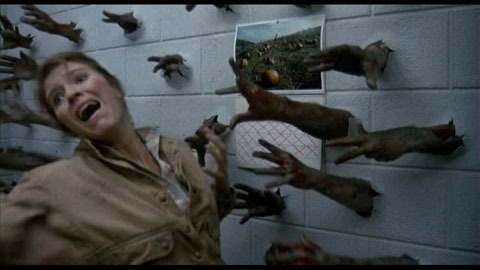 In particular, George Romero’s ‘Day of the Dead‘ with Mark Tonderai set to direct. This will be a modern day telling of the 1985 film and is the second time they’ve remade this. Just leave it alone. If you remember, Millenium Films remade this in 2008 with Mena Suvari and Nick Cannon starring and Steve Miner directing. Now I guess they are remaking a remake within five years. This is just awful. The new story takes place in a zombie ridden world where most of Earth’s population is a zombie, but a group of scientists and survivors try to find a cure, but instead, open up Pandora’s box. Well, it seems that they have the overall story arc staying the same, but opening Pandora’s Box is something new. I don’t have any hope for this as Tonderai’s big claim to fame was directing ‘House At The End of the Street‘. But I guess Millenium Films just wants to capitalize on the zombie craze still. Your thoughts? Dallas Comic Con 2015: ‘Day of the Dead’ Panel! The Top 20 Zombie Movies To Sink Your Teeth Into!!! This entry was posted on Monday, November 25th, 2013 at 2:57 pm	and is filed under Film, News. You can follow any responses to this entry through the RSS 2.0 feed. You can skip to the end and leave a response. Pinging is currently not allowed. « Wilmer Valderrama Cast in the ‘From Dusk Till Dawn’ Series!!! [after his outburst scares Anna and Ethan] It's just... I was saving that bacon!